When I first visited Bangkok as a traveler, I didn’t fully discover the city’s shopping potential. I’ve window-shopped at some big malls with the same brands you have everywhere. And I’ve strolled around markets with hundreds of elephant-printed items hoping to end up in a tourist’s home. Then you may be asking yourself the same question I asked myself, when I moved to Bangkok exactly one year after my first visit. Whether you’re a traveler or an expat in this city, you like to find items that are unique and bring you a true piece of Thailand. Not a fake designer item or an H&M dress that everyone can buy, right? 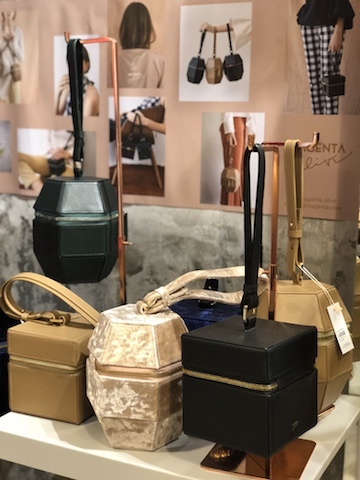 No, you’re looking for something special created by a Thai designer, that no one else has back home – whether it’s for yourself, reminding you of the great time you spent in Thailand, or as a gift for a loved one. Boy, do I have the solution for you! 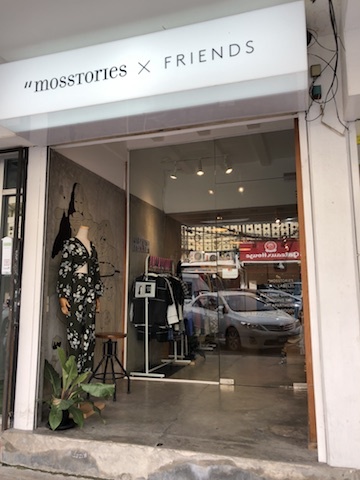 On my blog I’ll share with you the best small shops in Bangkok, the coolest Thai designers and their handmade products. I love exploring my new hometown for small local brands that make original and sustainable items – and sharing these with you makes me even happier! Ok, let’s move onto what you came for – Bangkok’s hidden shopping gems. Here’s my list of 5 favorite areas that you cannot miss as fashion lover in this town. Siam Square is an area that most visitors overlook, as it lies in the shade of one of Bangkok’s biggest malls, Siam Paragon. It consists of some smaller malls (Siam Square One and Siam Center Point) and several streets with quirky small shops. If you’re into independent labels, don’t miss out on this area! 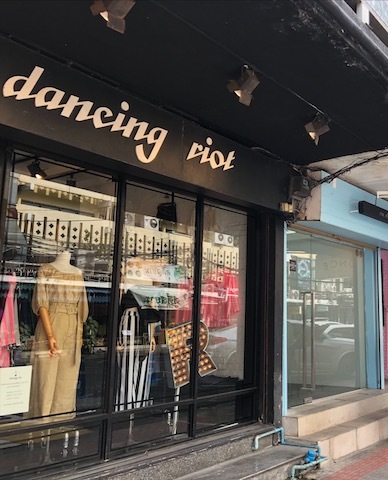 One of my favorites is Thai brand Dancing Riot, located at Siam Square Soi 2. 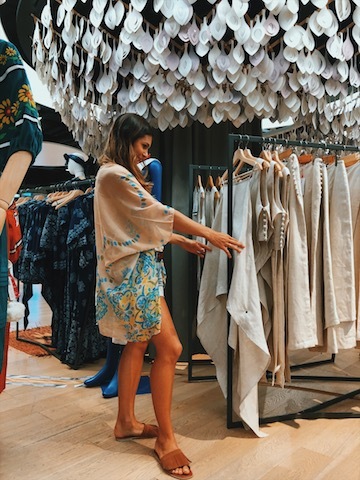 This is your go-to shop if you want to know what Thai urban chic is all about! A few houses further you’ll find Mos Stories. 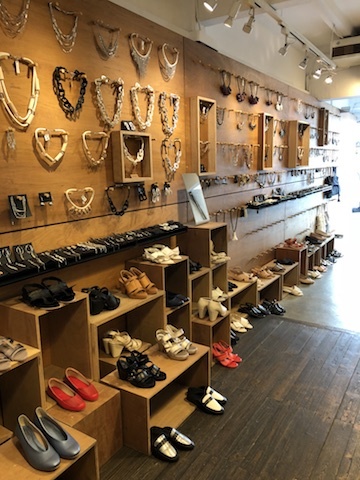 This shop has its own line of jewelry and shoes with a cool minimalist style, as well as clothes and accessories from other Thai brands. If quirky doesn’t scare you off, be sure to pop by Daddy And The Muscle Academy and Mermaid Castle. 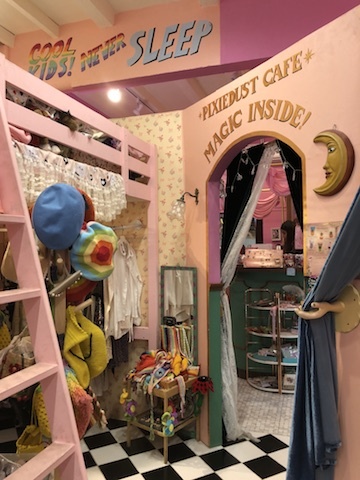 These shops would fit in Tokyo’s Harajuku district with its crazy vibe and funky items. Have a peek yourself! On the corner you’ll spot multi brand store Sense Of Style. Here you’ll find several Thai brands under one roof. In the same vein, you can have an (air conditioned) look in both malls of Siam Square One and Siam Center Point. You’ll be in the company of many fashionable Thai teens whose university is a block away. 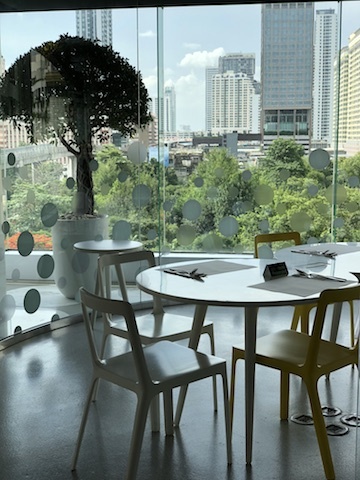 If air conditioned shopping is more your thing in Bangkok, head to these two shopping malls. 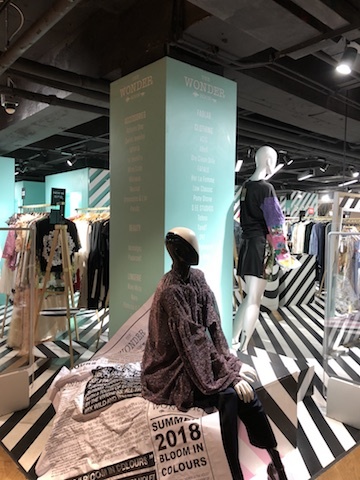 They’re adjacent to their big brother Siam Paragon – but whereas the latter has all the major international brands, Center and Discovery are home to several Thai designers. 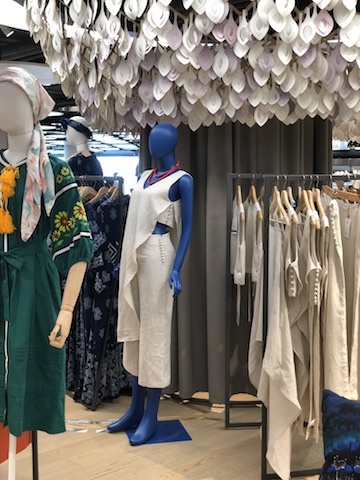 At Siam Discovery my favorite spot is Ecotopia on the fourth floor, which gathers a selection of sustainable Thai brands. You can marvel over your goodies while having a drink or bite there, and admire the view. Thong Lor is an area in Bangkok around Sukhumvit Soi 55, most know for its abundance of up-class restaurants and bars. But also fashion lovers will feel at home here. 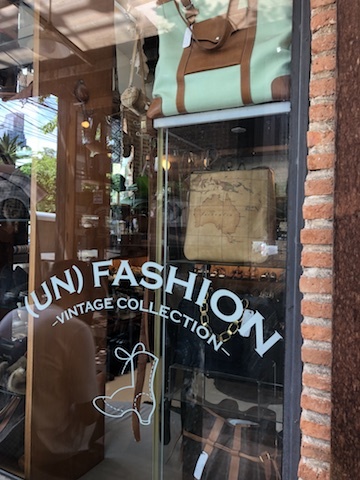 If you’re into vintage, you’ll have a great time at Thong Lor Art Village. 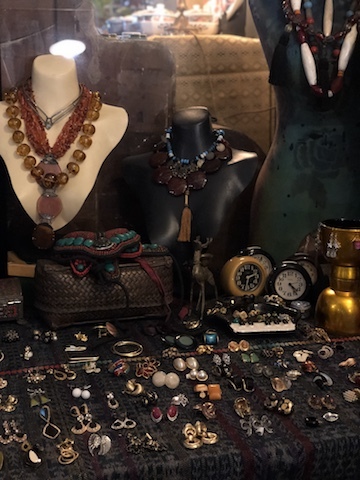 The owner is a quirky Thai lady who’ll be happy to show you around her shop, which comprises several parts: one with vintage clothing, one with jewelry and accessories, and last but not least a funky bar! 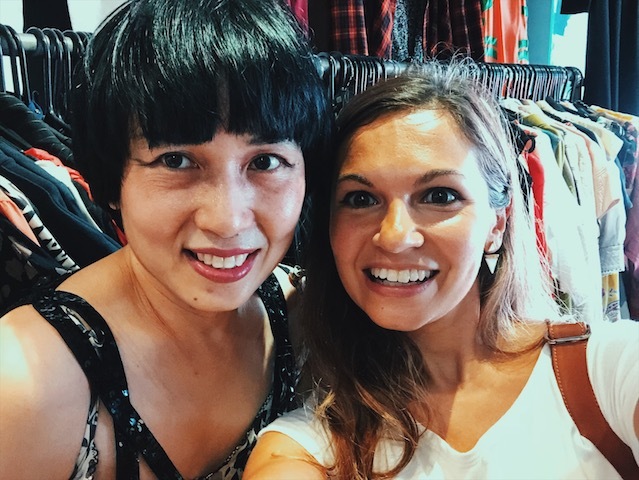 Next on your vintage shopping spree is Eco Ring, a bit further down the street. 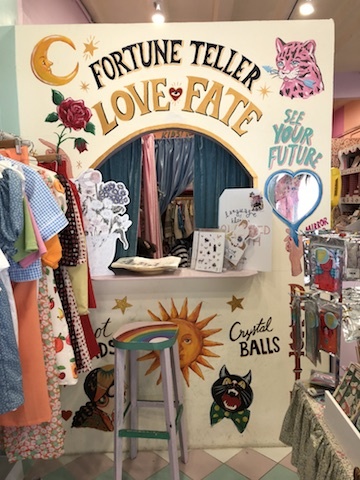 You’ll find clothing, accessories as well as home deco here. 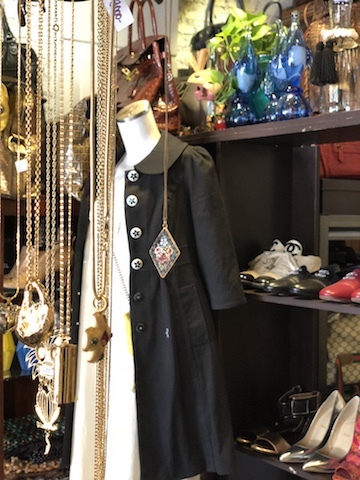 The third vintage spot worth exploring is (Un)Fashion, with two shops for vintage loving men and women. In between there’s a small coffee bar to refuel your energy. 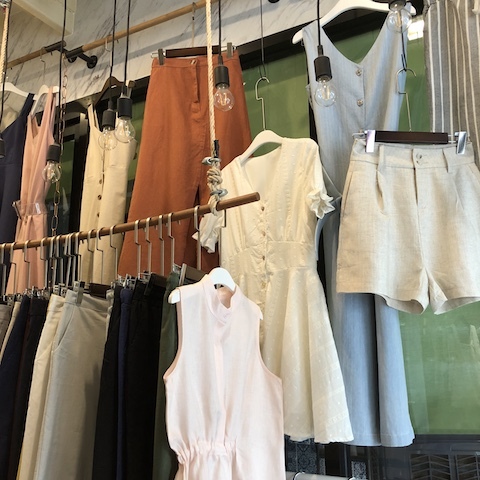 If you’re looking for a breezy linen piece, pop by Veniza (next to Thong Lor Art Village). The owner is a friendly Thai woman who makes everything by hand and will be happy to advise you. Last but not least Paya is one of my favorite shops in this area. 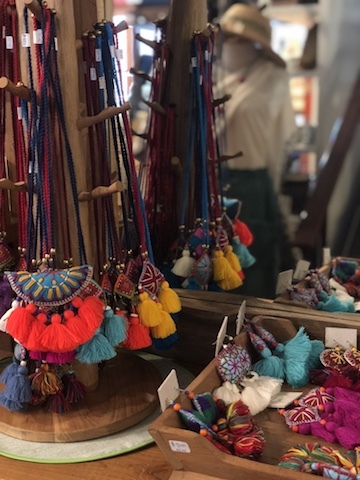 It mainly has teak furniture and colorful home deco, but also beautiful scarfs, jewelry and other accessories from hill tribes in the North of Thailand. 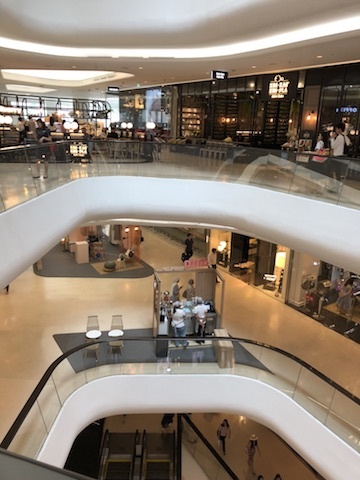 Central Embassy is a fancy mall with lots of international high-fashion labels, but there are two good reasons to walk in if you don’t have an unlimited budget. First, it hosts several pop-ups of small Thai designers. 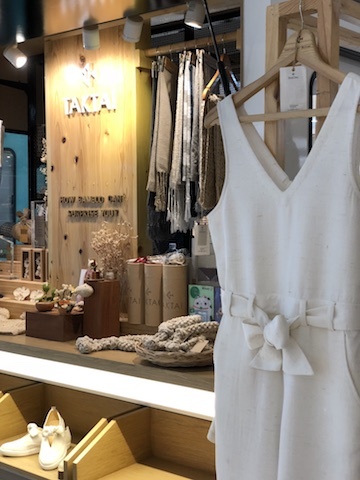 On the third floor you’ll find Taktai, a sustainable Thai brand producing bamboo clothing and accessories. 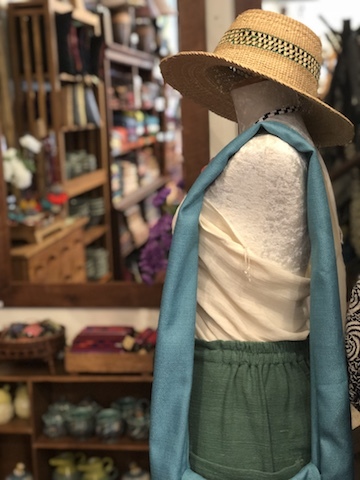 It’s perfect to score a unique summer piece or original gift. If you’re looking for a dress that will catch everyone’s attention, Nara is your go-to brand. 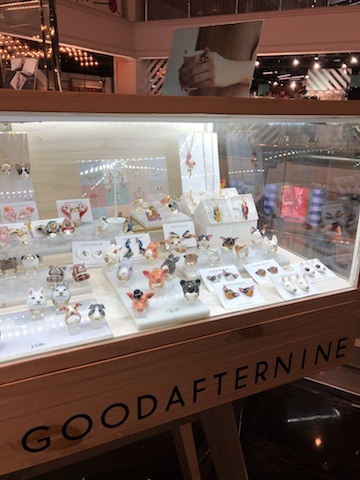 Designer Letar has her pop up (with coffee bar!) on the fourth floor, and a fully-fledged Nara shop will open there soon. Secondly, on the sixth floor you’ll find Open House. For me it’s an oasis during an uptempo shopping day or in between work appointments. 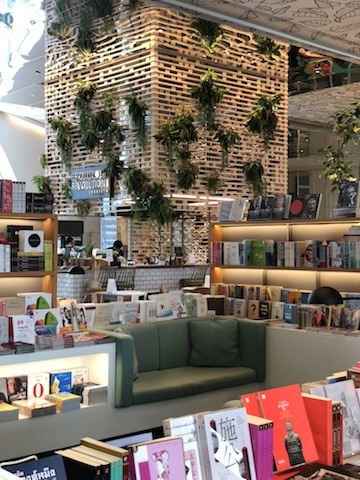 It’s a beautifully designed floor with wood and green, where you can enjoy a coffee and snack and forget the world outside over one of the many books on display. If you’re in Bangkok during a weekend, you can’t miss out on its biggest market called Chatuchak. You’ll find literally everything there – from clothing to accessories, shoes, home deco and art, plants and pets. 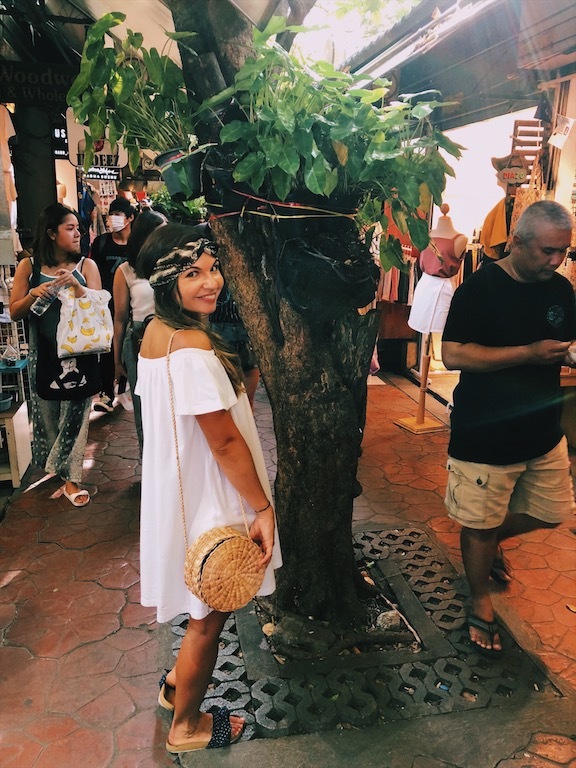 If your time is limited, or if you want to score some cool fashion items without the fuss, read my blogpost where I share my favorite shopping spots at Chatuchak market! Any other shopping gems you’ve found in Bangkok? Any questions, thoughts or comments? I love hearing from you – drop me a comment below or reach out through my contact page!